I’ve been waiting for this for a while so I was glad when they finally released this. Now for some initial feedback. First off, the download was reasonable – size and speed wise. The installation was, lets just say ok – as I had to reboot since it had to update some libraries that were is ‘use’ at the time. Registration was also not too bad – since I have an old existing Hotmail/Live account where more of the details were already populated. Running it for the first time is where the shock comes in… it is as ugly as hell (reminds me death, all grey and boring). Unfortunately the same would apply to any of the other Express and even full versions of VS2012. Functionality wise it provides just the very basics – not that you can expect anything more. Since I haven’t installed the ‘full’ express version I cannot comment on any other functionality that version might have. 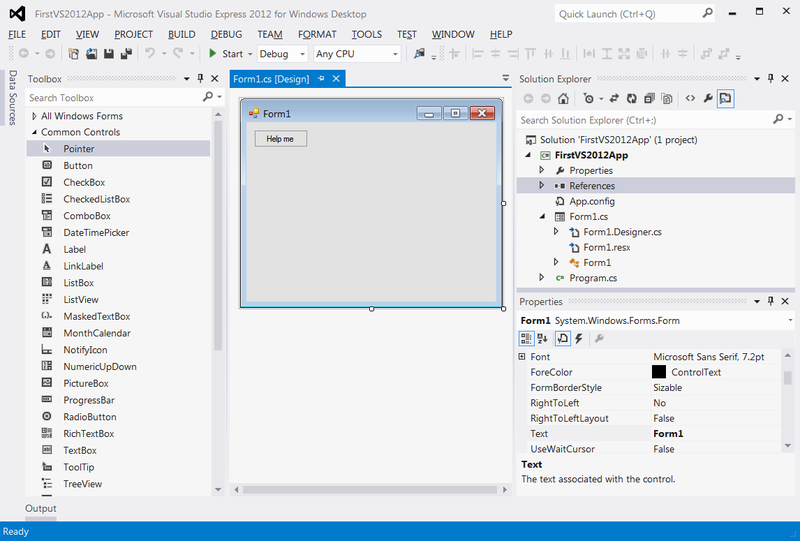 Anyway, The only templates worth mentioning is the Windows Forms, WPF and Console ones. Again, one cannot expect anything more of this release. Interestingly enough, when creating a new project the framework version cannot be changed on the ‘create project’ dialog screen. You can only change this ‘after’ the project has already been created. One nice thing is that you can still create custom toolbars with ‘external’ commands – I use it to run a source backup tool I created some time ago. Another thing to remember is that this tool can be installed in Windows 7, unlike the full Express version that can ONLY be installed on Windows 8. The Web express version can also be installed on 7 (plus the TFS Express version). In order to try it out you can follow this link. If you like to change the overall theme and don’t like the built-in Light or Dark there are some more options if you look at this blog entry.